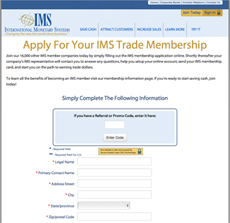 Join our 16,000 other IMS member companies today by simply filling out the IMS membership application online. Shortly thereafter your company’s IMS representative will contact you to answer any questions, help you setup your online account, send your IMS membership card, and start you on the path to earning trade dollars. After your application is accepted and processed, your personal trade broker will be in touch with you to help you setup your online account, confirm the details of your account, and begin learning your business model to best market your product or services to other IMS members. From that point forward, you and your personal trade broker will keep in touch regularly to best service your needs. Your trade broker will help you sell what you want to sell, as much as you want sold, to keep trade as a healthy complement to your established cash business. This relationship with your trade broker ensures that trade sales doesn’t overwhelm your business during times that your cash business is the busiest, but still allows you to leverage your trade dollars on the purchases that conserve your cash in the bank!